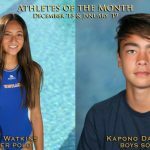 Congratulations to Fiona Watkins (Girls’ Varsity Water Polo) for being named the December Athlete of the Month and Kapono Dacascos (Boys’ Varsity Soccer) for being named the January Athlete of the Month! Girls Varsity Water Polo · Jan 31 Girls Varsity Water Polo falls to Newbury Park 9 – 4. Girls Varsity Water Polo · Jan 25 Girls Varsity Water Polo beats Thousand Oaks 10 – 3. Girls Varsity Water Polo · Jan 23 Girls Varsity Water Polo falls to Oaks Christian 20 – 5. Girls Varsity Water Polo · Jan 21 Girls Varsity Water Polo beats Ventura 9 – 4. Girls Varsity Water Polo · Jan 21 Girls Varsity Water Polo beats El Dorado 9 – 8. Girls Varsity Water Polo · Jan 21 Girls Varsity Water Polo beats Palisades Charter 9 – 8. Girls Varsity Water Polo · Jan 21 Girls Varsity Water Polo beats Hueneme 16 – 1. Girls Varsity Water Polo · Jan 21 Girls Varsity Water Polo falls to Temple City 9 – 5. Girls Varsity Water Polo · Jan 18 Girls Varsity Water Polo beats Calabasas 13 – 2.